Destilerías Plà have a solid distribution network established during decade thanks to the loyalty of its customers and the quality of their products. Destilerías Plà is located in the town of Puçol, 15 kilometers from Valencia capital. 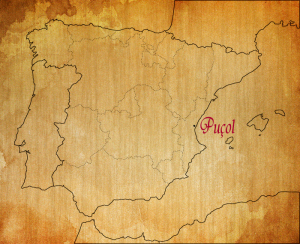 Its location in the crossroads has fostered a strong physical distribution network which has its zone of influence in the north of the province of Valencia, Castellón and Teruel. Puçol situation, where Distilleries Pla town sits on the map of Spain. Years of relationships that have formed a strong network of customers has expanded over the years. Our customers are very motley, from bars and restaurants of all categories including to three holders, through special furnaces to produce their products with Destilerías Plà liquors. Map of municipalities that are within the deployment path Distilleries Plà. Besides right now Distilleries Pla is ready to increase their range so if you have a business and are interested in offering Plà products, we urge you to contact us by phone 96 142 09 13 or email info@destileriaspla.com.